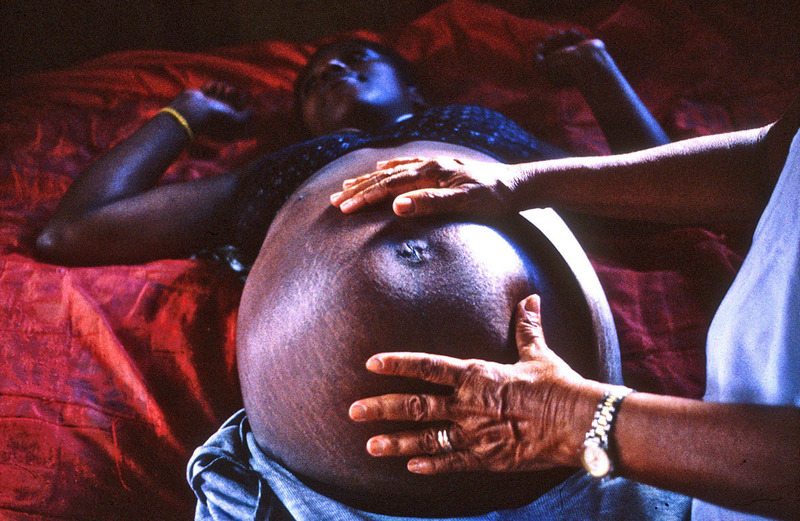 The midwife Nazaré Ribeiro massages Gesilene Gomes few days before having her baby in Laranjal do Jari village, Amapá State, Brazil, on 13 Jannuary 2004. The Government of the Brazilian State of Amapá has determined to pay a small the equivalent of half minimum salary to all “parteras” (midwifes) registered in the State. The government of the State will pay for it. It is another step towards the legalization and recognition of this important worker figure in the Brazilian society. The activity of midwife is very important for the communities living in the remote areas of the Amazon forest. Mostly of the time they are the only points of reference for many pregnant women: no doctors, no nurseries in the deep forest. The midwifes represent an informal healthy system present in the Amapá State and in many others parts of the Brazil.